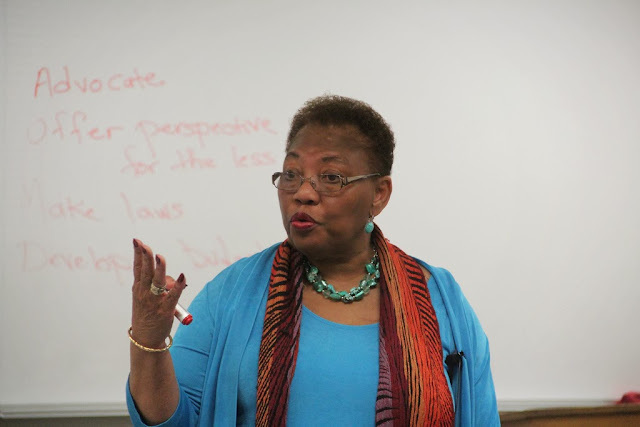 ORLANDO — Speaking with students at Valencia College on Friday, March 29, Florida State Senator Geraldine Thompson, D-Orlando, made clear her stance on several hot-button issues including a bill (SB 196) that would allow for a statewide domestic partnership registry. Several news organizations in Florida including the Orlando Sentinel and Miami Herald reported that Thompson missed a vote for SB 196 on Tuesday, March 12 due to unexplained health issues. Her vote as part of the Senate Children, Families and Elder Affairs Committee is considered vital for this legislation to move forward and missing the vote forced the legislation's sponsor to postpone this bill for a second time. Thompson worked for Valencia Community College for 24 years as the director of the Equal Opportunity Office and assistant to the college president. There she established the “College Reach Out Program” and help found Valencia’s “Bridges to Success” program, working to help disadvantaged and at-risk students to continue their goals in post-secondary education. One of the events that propelled Thompson to get involved in government affairs was when cuts in education threatened to end the “College Reach Out Program,” and she along with other supporters were able to fight this action. This program and its legacy of helping high school students with their transition to college was eventually cut by Florida legislature in recent years. Since leaving the college seven years ago to pursue her own goals in the Florida legislature, Thompson has often come back to Valencia to speak with students involved with the ever-growing “Bridges to Success” program. “The greatest thrill of it all is when I see a student that comes back and say ‘I finished my professional degree and I have a job, and it’s because of Bridges that I’m here,’” said John Stover, manager and founder of Bridges to Success. Stover stated that in “Bridges” has helped over 2,600 students throughout its 27 years of existence and it considered one of the top mentoring and assistance programs in the nation because of its success and high graduation rates. “I’m able to focus on my academics and without it [Bridges] I would be focusing on financial more than academics,” said Danielle Jordan, 20, who is a Sophomore at Valencia College. Students involved in this program showed a high level of respect and admiration to Thompson throughout her discussion with them. They asked about several issues, including civil unions and college assistance programs that Thompson went into detail to explain. She is currently involved with seven committees (two of which she is vice-chair), addressing issues that directly influence the Central Florida area including transportation, economic development, commerce and tourism. “Coming from me, as a young African-American female, seeing how far she has progressed in life and seeing the things she is doing shows me that I can do it as well and be successful,” said Jennifer Hamilton, 19, a member of the female mentoring group within “Bridges to Success” called R.E.G.A.L for Remarkable, Elegant, Gifted, Ambitious, Ladies.